The UEFA Euro 2016 kick-off is almost upon us. Turn your classroom into a football stadium with the Euro 2016-themed teaching resources. The UEFA Euro 2016 tournament starts in France on 10th June. It’s an exciting event for young and old alike. So why not meet the youngsters where they already are? It’s often difficult to keep students motivated to learn just before the summer holidays. But what if you were to turn the classroom into a football stadium? You see, football and enjoyment of sports are themes that most young people find interesting. At the same time they are highly suitable for project-based work in class. Football and sports are motivational themes for young people | © JackF - Fotolia.com For example you could introduce the German national team, or have the class commentate on their favourite team’s last match. 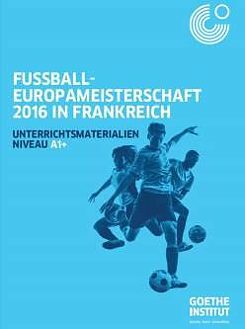 To commemorate the UEFA Euro 2016, the Goethe-Institut in Paris has prepared a comprehensive pack of free teaching materials including teachers’ notes. These resources are suitable for language levels A1+ and B1+. You can focus on the football theme at two different levels (A1+ und B1+) with your class. The concept’s the same at both levels: the worksheets build on each other and prepare the students so that they are ready to present a TV or radio show in the style of the German sports show Sportschau. Of course the worksheets can also be used individually depending on the learning objective. All four skills are practised, whereby there is a significant emphasis on oral expression. The students learn relevant vocabulary, repeat key sentence constructions and much more. My family is a team etc. Reactions after the match etc. We wish you and your class lots of fun with your sports show! Eva Korb works as a publicity, advertising and multimedia coordinator at the Goethe-Institut Paris and is also responsible for various projects relating to UEFA Euro 2016 in France.